Good food isn’t cheap and cheap food isn’t good. Do you ever get tired of the same old salad greens? I know that I do. It is convenient to buy those large containers of organic baby spinach from supermarket. They are fast and easy. They’re also versatile. A handful in a smoothie, a handful in a stirfry, a quick salad that can be made in a couple of minutes. Spinach can get boring after a while. Lately, when I’m in the mood for some fresh, delicious, and different salad greens, I head over to our local farmers market at the Evergreen Brick Works. The vendors there never disappoint me. I’ve been having a love affair lately with the outstanding produce grown by Cookstown Greens. Today I threw together a small salad for lunch in about two minutes using their greens. 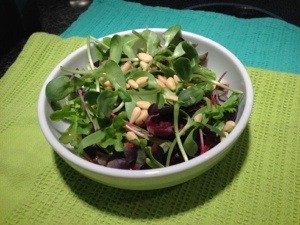 A handful of their baby greens, topped with their sunflower sprouts and a few pine nuts I found in my fridge was an easy way to get some veggies in at lunch time. Their baby greens are not only delicious, but they are also so beautiful to the eye, with gorgeous edible flowers in the mix. I spent about $15 on their greens this week. Yes, they are more expensive than lettuce you will find in the supermarket, but it is well worth it. I find when I buy produce at the farmers market it is remarkably fresh. This means it lasts longer in my fridge, and I throw less out. Here’s what they put in their baby greens mix: Hand-picked lettuces, mustard, cresses, gold and crimson chards, spinach, arugula, seedlings and petals. And here is a picture of my simple lunchtime salad. Categories: Cooking, Food, Vegan | Tags: greens, lunch, Salad | Permalink.